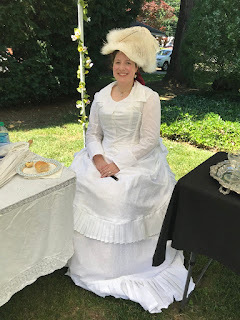 During the later part of the 19th century, Victorian fashion migrated from the large hoop shapes of the mid 19th century 1850's and 1860's (Civil War and after), to the gradually narrowing shapes of the 1870's bustles. 1870's metal bustles used less metal support than earlier hoops, and they also used other material like horsehair, and layers and layers of ruffles underneath to create the look. Light summery bustles like the early 1870's pleated cotton summer bustle I made (based on extants and fashion plates from 1870-1872) , were often worn at the seaside and were considered more daring and even at times "fringe" to society, rebellious in their own way with their light fluffy layers and often semi sheer or sheer cotton. 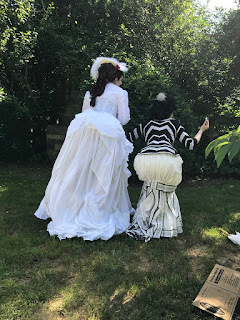 Underneath is a Victorian corset made by Historical Designs on Etsy, my TV wire bustle and two TV ruffled silk petticoats. How historically accurate is it? Very. It was machine sewn (appropriate for the time), using Truly Victorian patterns, with all the appropriate foundation garments for support. I ran out of time to add buttons or fastenings, so it was pinned on. Pleated hems on trained skirt and apron front. Hours to complete: Many. I'm not great at keeping track, lol. I started in late May and worked on it sporadically on weekends and as I could grab some time weeknights. I stayed up really late the night before finishing the bodice and pleated hem. First worn: this past Saturday to a friend's Victorian "At the Races" lawn party. I paired this with vintage seed pearl earrings & ribbon necklace from LadyDetalle on Etsy, and a white summer "floofy" hat I pinned together quickly two days before (previously I had wired it and covered the bottom and brims with cream silk, intending it for use for another era). Total cost: All STASH! The fabric was Jomar $2 a yard and I used approximately 14 yards. 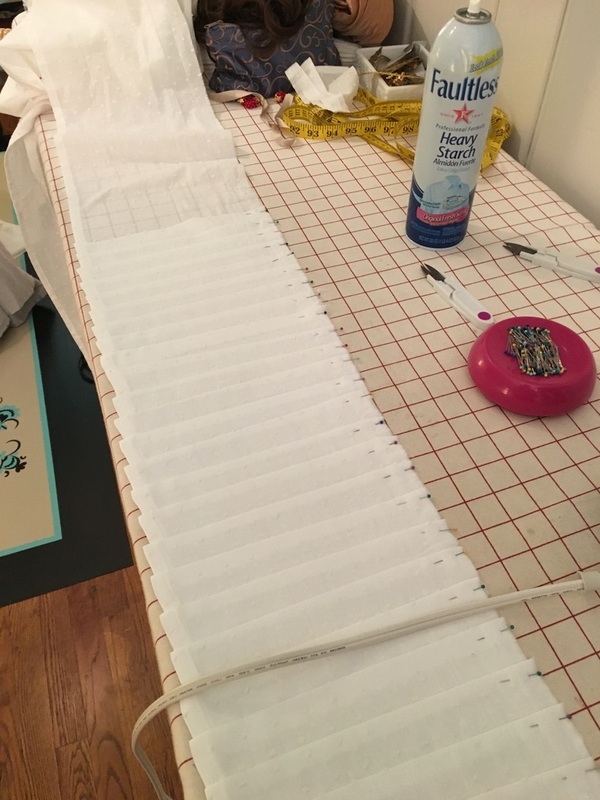 More yards coming as I'll add more pleats and trim in future (I ran out of time: I was starching and ironing pleats until 1:00 am the night before the event). Bodice boning and interfacing was stash. This was a really fun summer bustle project that I've been thinking about doing for ages, and it was finally time! Have you made a summer bustle yet? What are your thoughts on the "rebellious" summer bustle trend? using heavy starch and my iron! Link to event album on Flickr (still uploading photos!). A collection of reproduction historic jewelry, designed for ROYAL wear. 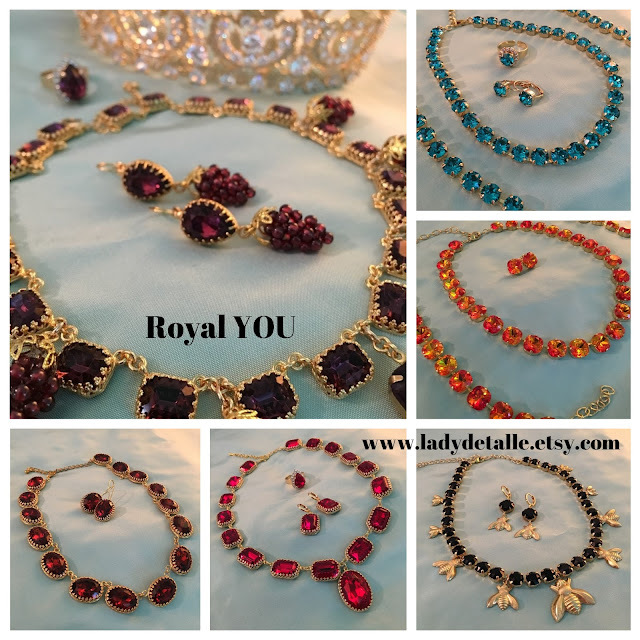 Royal You is reproduction historic jewelry designed for fancy dress or costuming royalty or nobility of English, French or European court focusing on the 18th & 19th centuries. 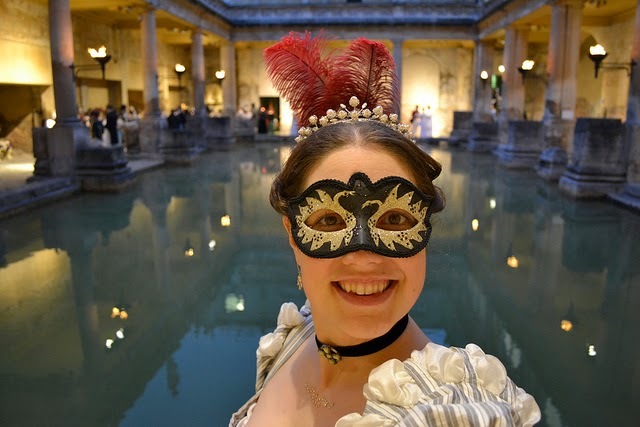 Great for historic events, re-enactments, trips to Versailles, Jane Austen balls or modern wear, this line will be focused on fun designs and historic detail! 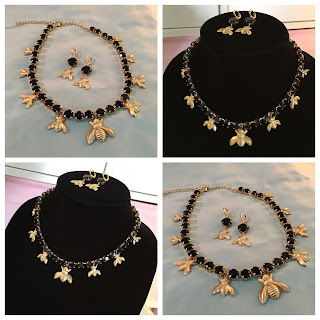 The first released design of ROYAL YOU, "Josephine" necklace featuring Jet Black Swarovski crystals and gold BEES in graduated fashion, with optional matching earrings. Top connected gold-plated settings and an extender chain for great fit: truly a necklace fit for royalty and Napoleonic Court! Available now on LadyDetalle on Etsy. This necklace is meant to worn at the neck but can be extended down, truly a necklace fit for the royalty or nobility of the English, French or European court of the early 19th century Regency NAPOLEONIC era. The stones are a lovely solid JET black Swarovski crystal and BEE design. 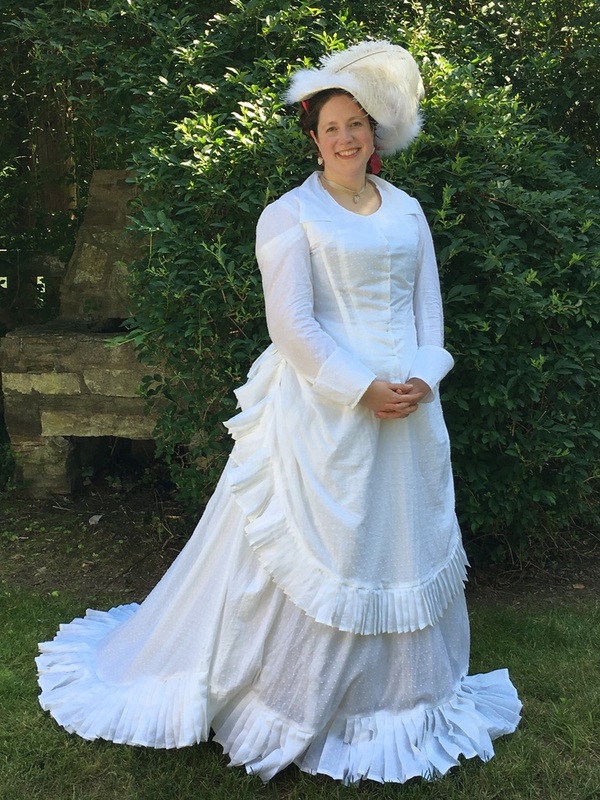 Great for historic events, re-enactments, or modern wear. Stay tuned for more ROYAL YOU designs coming soon!